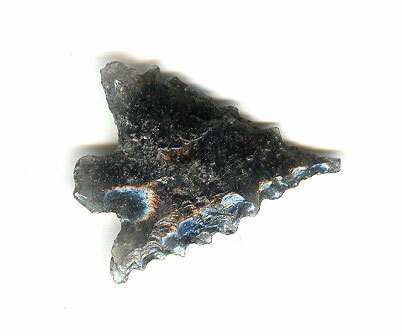 A Small To Normal Size, Visibly Aged And Anciently Use Sharpened Nicely Made Calapooya Arrow Point That Exhibits Surface Frosting Aging And Stone Patination, Aging In The Basal Stem Notches, Correct Short Narrow Stem And Blade Edge Serrations, Overall Aged Surface Deposits, Correct Blade Use Sharpening Reduction, Correct Material And Manufacture For The Area Found. Found Near The Town Of Corvallis, Oregon In The Willamette Valley, Benton County Oregon. This Is A Stemmed Example And Side Notched, Triangular And Ovate Points Also Occurs In The Serrated Type. Includes A Ken Partain Certificate Of Authenticity.